Click leaf blocks to harvest fruit. Fruit trees are found growing naturally in the wild in areas with an average biome temperature between 10 and 25, and a rainfall value of at least 500. In order to get a sapling, the cross-shaped branches of fruit trees must be broken with an Axe or a Saw. There is roughly a 50% chance that a sapling will drop. Note: In colder/drier climates during the fall, leaves turn brownish-orange for all trees. Fruit tree saplings do not grow instantly. Instead, fruit trees grow slowly, getting taller over time, growing (or regrowing) leaves and branches. 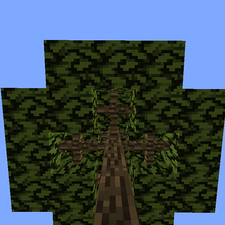 This means that the branches can be harvested for saplings, and that they will eventually grow back. Unfortunately, this also means that it can take a very long time to grow trees as large as those encountered in the wild. The trunk will grow to full height after 30 days, a single branch will grow every 20 days, and a single leaf block will grow every 2 days. Fruit trees will produce a single piece of fruit per leaf block during its harvest season. To harvest the fruit, Right Click or Left Click the leaves and the fruit will drop. All fruit trees drop pieces of fruit ranging from 4 to 16 oz in weight. Added First Fruit Tree: Apple. Added Banana, Green Apple, Orange, Lemon, Olive, Cherry, Peach, & Plum Trees. Fruit trees are more rare in the world. Fruit is harvested by right-clicking the leaf block instead of breaking it. Naturally generated fruit trees have the same number of leaves as player grown fruit trees. Tweaked hitbox of fruit tree branches to make it easier to harvest saplings and fruit. Fruit can be harvested from leaves using left or right click. Nerfed amount of fruit each leaf blocks drops to 4 - 16 ounces. Fruit trees only produce fruit when the current temperature is between 0 and 38. For the majority of cases, the seasonal requirements (Spring to Late Fall) already fall into this temperature range, with the exception being extreme areas such as deserts, very few jungles near the equator, and the deep tundra. The cross-shaped branch which is harvested to obtain saplings. This page was last modified on 18 January 2015, at 06:50.